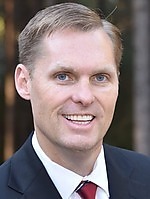 Info Michael Guest is the current District Attorney for Madison and Rankin Counties, and is a Republican candidate for the U.S. House of Representatives in Mississippi’s Third Congressional District. Michael Guest is a lifelong conservative Republican who believes in limited government, traditional Mississippi values, free market economic principles of lower taxes and fewer regulations, protecting the right to life of the unborn, a strong national defense with full support of our men and women in the military, and keeping our 2nd Amendment gun rights and the other individual rights and liberties guaranteed to us by our Constitution. As Madison and Rankin Counties grow, District Attorney Guest has sent a message to criminals and would-be criminals that if they break our laws, they will be punished and that strong sentences will be imposed. Since being sworn into office as the Madison and Rankin County District Attorney in January 2008, Michael Guest and his staff have prosecuted nearly 20,000 cases. Michael Guest has a proven record of fighting for Mississippi’s families to prosecute criminals—and he will take that same spirit and determination to Washington, D.C. to fight for Mississippi’s interests while serving in Congress. District Attorney Guest has worked with the media to launch The DA’s Most Wanted, which has been successful in capturing dozens of criminals who had failed to return to court to face the penalty for their crime. His office has supported law enforcement agencies by providing them more than $20,000,000 in money seized from those who sell or transport drugs. The District Attorney’s office has also successfully recovered more than $3,500,000 through their Bad Check Unit to help local merchants and businesses. As District Attorney, Michael Guest built a team of outstanding professionals whose goal is to keep neighborhoods safe places to live, raise our families, worship and build businesses. With more than 12 years as an Assistant District Attorney, Guest prosecuted hundreds of cases and obtained guilty verdicts against criminals charged with murder, manslaughter, armed robbery, sexual battery, aggravated assault, kidnapping, house burglary, and drug sales. District Attorney Guest has worked with the law enforcement community training state and local law enforcement officers. He served as an instructor for the Rankin County Sheriff’s Department, Hinds County Sheriff’s Department, Mississippi Law Enforcement Training Academy, the Mississippi State Highway Patrol, and the Mississippi Bureau of Narcotics. District Attorney Guest serves as President of the Foundation for Rankin County Public Schools and serves on the Boards of the State and Central Mississippi Crime Stoppers. As a member of the Brandon Baptist Church, Guest serves as a Sunday school teacher and as a deacon. Michael Guest is a Rankin County resident and a graduate of Brandon High School. He received a degree in accounting from Mississippi State University and his law degree from The University of Mississippi. Guest is also a member of the Rankin County Bar Association and the Mississippi Bar Association. He is married to the former Haley Kennedy and they have two sons, Kennedy and Patton. 03/10/2020 MS District 03 - R Primary ?? ?